Renal cell carcinoma is a polygonal clear cell that derived from the tubular epithelium. 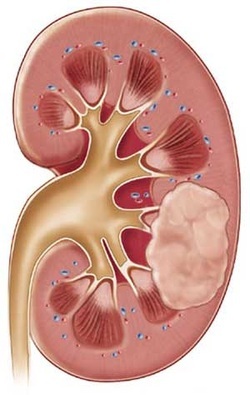 Renal cell carcinoma is the most common renal malignancy which is due to smoking. There is also an association between renal cell carcinoma and von Hippel- Lindau disease which is deletion of chromosome no 3. Renal cell carcinoma occur mostly in elderly men. Renal cell carcinoma may present with mass which is palpable in the region of the flank, loss of weight and hematuria. Renal cell carcinoma may spread hematogenously after invading the inferior vena cava into the bones and lungs. Laboratory investigations and imaging techniques may reveal the present of mass on the renal ( detected by CT scan) as well as the present of secondary polycythemia which occur as a result of increase production of erythropoietin. Renal cell carcinoma is also associated with paraneoplastic syndrome. The treatment of renal cell carcinoma may include radical nephrectomy. 1.Cohen, Herbert T., and Francis J. McGovern. "Renal-cell carcinoma." New England Journal of Medicine 353.23 (2005): 2477-2490. 2.Curti, Brendan D. "Renal cell carcinoma." JAMA: the journal of the American Medical Association 292.1 (2004): 97-100.